The Museum held one workday in August 2012. The weather was decent, but windy and gusty. Turnout of volunteers was good and some significant work was accomplished on the various projects! 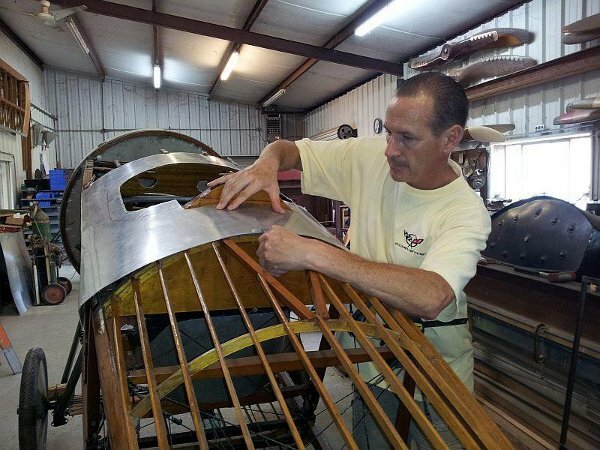 Ron Marcotte and Jerry Stark continued to work on the cheek cowlings for Tommie II. They spent a great deal of time attempting to understand some modifications to one of the edges of each piece. Apparently each piece has a steel strip added to the upper edge to assist in attaching it to the airframe. The steel strip forms a lip that hooks onto the oak frame that supports the upper edge of the cowling piece. Once the upper edge of the cheek cowl is latched onto the support frame the mechanic just bends the lower edge of the cheek cowl into place and inserts the rod in the piano hinge that anchors the bottom edge of the cowling. When we really started looking at how much room one has to actually get fingers in there to work with, it looks pretty difficult to reattach the cowl, but time will tell. Steve Richardson and Bob Herbage worked on Tommie I, shaping the upper longeron fabric rub strips to match the fuselage's curves. The first step was to soak the wood strips in an ammonia mixture to soften them up so the strips will bend easily and conform to the curve the upper longeron makes as the fuselage necks down from the cockpit to the tail. After soaking the wood strips for about 30 minutes or so the wood had softened sufficiently to allow the strips to be clamped into position so they will dry in the shape required. Once the strips have dried to shape the strips will be attached to the longerons. Tom Miller (Thomas-Morse project lead) started off by sorting tools in a couple of drawers that had been completely upended last visit. Then Tom, Steve Richardson and Bob continued working on the cockpit coaming. By the end of the day the piece had attachment holes drilled and the piece had been cut to final size and formed, including the cockpit cut-out. Next work day will see a little finishing work completed and the headrest started. 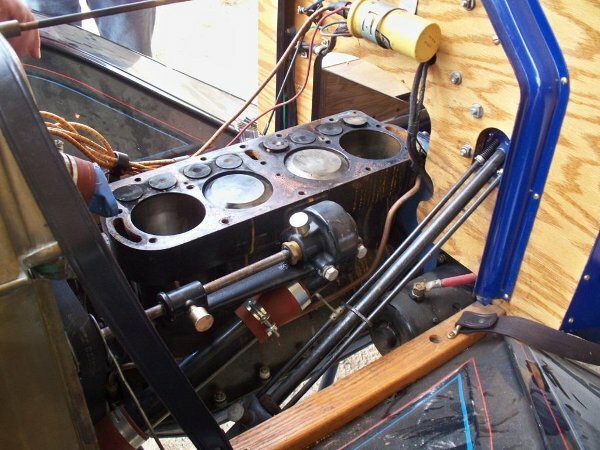 Mike and Don Craig finished the refurbishment of the Triplane's fuel system by replacing the gasket for the fuel strainer bowl at the bottom of the fuel tank with the proper rubber one. The gasket used is a fuel system gasket from a Piper Seneca. After further inspection Mike decided the fuel lines were OK for continued service, as they were pliable and free from cracks, defects and fuel flow obstructions. They appeared worn out because they were so dirty! That was a simple fix! Mike got into the airplane and conducted a test run. Mike says the engine now has tremendous power compared to the first time he operated the motor. Mike ran the engine through a full power run to ensure it turned up properly and the controls operated as expected. Everything was fine so the engine was shut down. Next Mike turned his attention to the tail skid and the tail skid steering system as he wasn't happy with how it was functioning, the skid was hard against the upper stop virtually all the time. He first tried taking a loop out of the tail skid bungee and the adjustment seemed to work great but after a short taxi the rudder got real close to the ground with the tail skid up against the travel stops. Mike removed the shock cord completely with an eye towards making further adjustments but in removing the cord noticed that the 2 lower wraps were twisted and therefore fighting each other and would not permit the bungee cord to stretch. Mike reinstalled the bungee cord with the same number of wraps it originally had but was extra careful to keep the wraps sequential and wrapped in the same direction. Mike reports that with an empty cockpit the skid almost touches the upper stop and you can push the tail down with one hand and feel the shock cord give just a bit. Furthermore, with the tail skid off the stop the skid steering functions correctly. As a final repair to the tail skid and its steering system Mike plans to replace the cable shock springs with stiffer units to ensure steering actually occurs at speed! The weather seemed promising for a test flight so the fuel tank was filled to about 10 gallons and the castor oil tank was checked to make sure it was acceptably full. However, the winds kept shifting too much so no flight was attempted. Mike was pleased to see that the fuel tank and the lines and valves did not seem to be leaking at all! Once the decision was made to not fly the airplane Mike started the engine again and taxied the airplane back to the hangar. With the assistance of some ground marshalling Mike first turned the airplane through a 270 degree right turn to get pointed back towards the hangars and "S" turned all the way back to the hangar to ensure he could see around the Triplane's nose. Mike says the turns are slow, but very predictable. As mentioned, for September Mike wants to replace the current springs in the tail skid steering cables with stronger springs. After consideration Mike prefers stronger springs compared to pre-loading the existing springs because you do not want the rudder / tail skid jammed to one side if a spring or cable broke or let go during a landing. Pre-loaded springs in the system would jam the rudder and tail skid hard over if the spring's tension isn't balanced by opposing forces in the other cable. Keeping the steering cables with no tension in the center / neutral position is the best option, but after his taxi tests Mike feels that there needs to be more force applied to steer the skid when you move the rudder full travel. 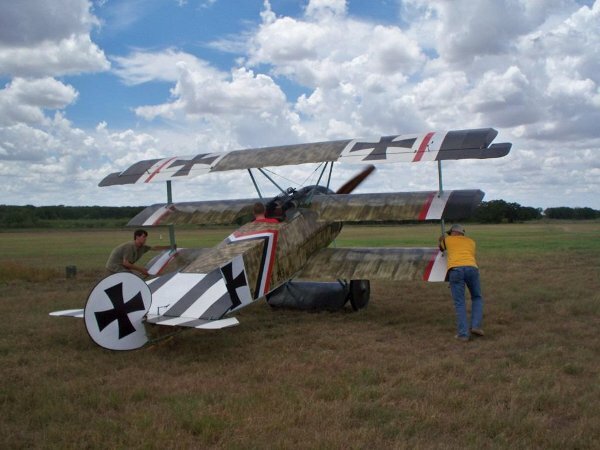 Sound thinking Mike – landing the Triplane is already exciting enough without building in another way to have a ground loop! But it does sound like the airplane is very close to flight! That is some exciting news! Dave Edgerly, Canuck Crew Chief, reports that he and a small crew of volunteers got the OX-5 engine out of the airframe and secured on an engine stand. The motor was moved to the main workshop - transported dangling from the forklift tines. Steve Freeman has asked Tom Moore and Kevin Monahan to remove the two offending cylinders with stuck exhaust valves so that the valve guides can be repaired. Hopefully, only those two will be removed as we hope to get the Canuck flying again as soon as possible. Dave also says that they had to remove the prop from its boss and leave the boss on the prop shaft as the proper tools to safely remove the boss couldn't be found! Since the Cub needed no work, John Goble and Ian Whitaker spent some time flying the airplane to get it a bit of exercise. A few guys got rides, including Ian's Dad, Dave! Ian also practiced touch'n'go landings to help keep sharp and reported having a blast in the gusty, variable winds. Ian did mention that the big tree on the south end of the runway is a real pain! Ian Whitaker, co-crew chief of the Pietenpol along with Al Sumrall, showed Steve Freeman "Old Pete's" prop - which looked OK until they noticed a small crack in the wood. Not sure what the next steps are, either trying to repair the current prop or obtaining a replacement prop. Mike Hallmark picked up the Triumph seat for recovering. Mike has already recovered the Indian's seat and he does very high quality work! Mike is a professional leatherworker, so this is an exciting development! Cameron Whitaker rewired the wrecker, producing a very clean and tidy wiring loom. Upon starting the vehicle up the wrecker ran very, very well. Lynn Howell finished his work bracing the Blue Racer's seat structure and returned the piece to Kingsbury. It fit well, looks good, and should go a long way to better supporting "modern" Americans! Lynn and Al Sumrall turned their attention to sorting out the Blue Racer's other issues, mainly a stuck valve in the engine. The stuck valve was freed without damage but it was a surprise discovery that the Blue Racer was equipped with a Chevy valve train! Dave Whitaker and Lynn had some reservations about the spring retainer and keepers, speculating that the non-standard components may have contributed to the stuck valve. That question will need some investigation. It is somewhat uncommon, but some people put in Chevy 350 exhaust valves to replace the stock Ford valves. The Team Vehicle guys are sort of favoring a return to stock Ford components. As usual, many of the running Model Ts transported volunteers to and from lunch in downtown Kingsbury. The Model Ts must be	running better as there have not been any rescue missions for a few months and no one has been laughing about parts falling off!